Amanda Faber is creating a joconde sponge, which is a dense almond flavored sponge cake. 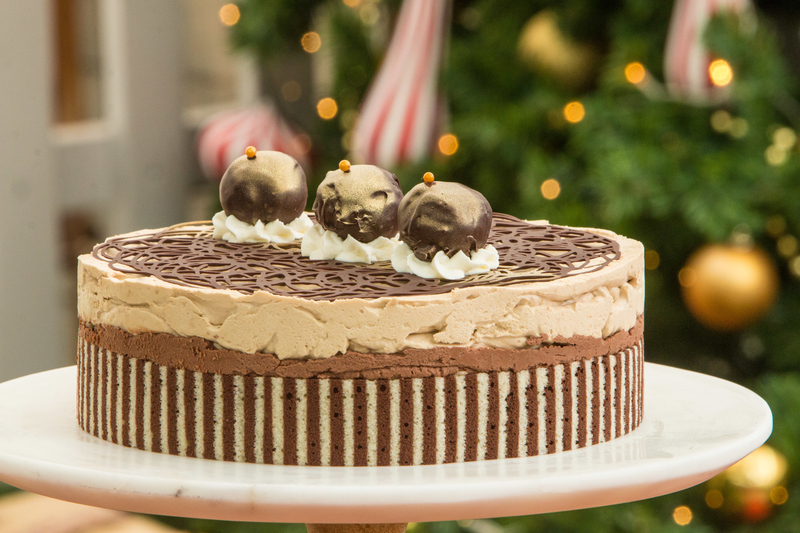 Chocolate is a decadent treat and Amanda is going all in by making this Hazelnut, Expresso and Chocolate Mousse cake for her birthday. The cake features a layer of chocolate mousse and expresso mousse topped with hazelnut truffles. She is definitely pushing her baking skills in this showstopper challenge. Watch the full episode of " Chocolate Week" from Season 2 Episode 5 of The Great American Baking Show to see if her hard work will result in a sweet reward. 1. In a small bowl, combine the gelatin and water. Set aside. 2. Measure out chocolate chips in to a medium bowl. Set aside. 3. Warm 3/4c of the cream in the microwave until almost boiling. Stir in gelatin mixture. 4. Add chocolate to the cream and gelatin. After a short sit, stir to combine. 5. Let the chocolate cool on counter while toasting the hazelnuts for the feuilletine. 6. In a stand mixer fitted with a whisk attachment, combine the rest of the cream and the confectioners sugar. 7. Whip until a thick whipped cream texture. 8. Fold 1/3 of the whipped cream in to the chocolate. 9. Fold all together. Chill. 1. Sift together the flour and cocoa powder. Set aside. 2. In a stand mixer fitted with a paddle attachment, cream together the butter and confectioners sugar. 3. Add the egg whites to the butter mixture. Mix until combined. 4. Add in the flour and cocoa. 5. Use and off-set spatula to spread thinly on a silpat. 6. Make a striped design by dragging a frosting comb across the paste. 1. Pre-heat the oven to 400° F/205° C .
2. In a stand mixer fitted with a paddle attachment, combine the almond flour, confectioners sugar, and flour. 3. Add eggs and egg yolk. Mix on high for 5 minutes. Set aside. 4. Put a new bowl on the stand mixer and change to a whisk attachment. Whisk the egg whites with the granulated sugar until soft peaks. 5. Fold half of the egg whites in to the other mixture. Then, stir in the melted butter. 6. Fold in the rest of the egg whites. 7. Pour, then spread, on the frozen chocolate design. 8. Bake for 5-10 minutes until just starting to brown. 9. When the sponge is removed from the oven, slice around the edges to loosen. 10. Using a mesh sieve, dust with powdered sugar. 11. Invert the cake on to a large cutting board. 12. Use a rolling pizza cutter to cut 2 long strips that are about 1 inch thick. 1. While the jaconde bakes, separate out 3tbsp of hazel nuts for the truffles. 2. Combine the cereal and remaining hazelnuts. 3. Melt the chocolate over a bain-marie. 4. Pour about 1/2 of the melted chocolate over the cereal and hazelnuts. Stir to coat. 5. If needed, add more chocolate. 2. In a small microwave safe bowl, warm 1/4c heavy whipping cream. Add gelatin and stir. Add espresso powder and stir. 3. In a stand mixer fitted with a whisk attachment, whip together the rest of the cream and confectioners sugar until a thick whipped cream texture. 4. With the mixer running on low, add in the espresso mixture. 1. In a small microwave safe bowl or over a bain-marie, heat the cream with the hazelnuts to almost a boil. Let sit for 5-10 minutes. Strain out hazelnuts. 2. Add enough cream to make 88g total. Heat until almost a boil. 3. Combine the chocolates in a medium bowl and pour over the hot cream. Stir until smooth. 4. Add in the Frangelico. 5. Chill until firm enough to roll in to tablespoon sized balls. 6. Cover in tempered chocolate. 1. Over a bain-marie, melt 2/3 of the chocolate to 114-118° F/46-48° C.
2. Off the heat, add in remaining 1/3 of the chocolate. Stir until 88-89° F/31-32° C.
3. Use off-set spatula, acetate forms, and piping bag to create decorations. 2. Place acetate cake collar inside a cake ring on the stand. 3. Line the bottom edge with two strips of jaconde cake. 4. Fill the bottom with feuilletine. 5. Top with chocolate mousse. 6. Top with espresso mousse. 7. Top with chocolate disk. 8. Garnish with truffles and chocolate decorations. 9. Chill whenever not being worked on. 10. If needed, place in freezer for 20 minutes.